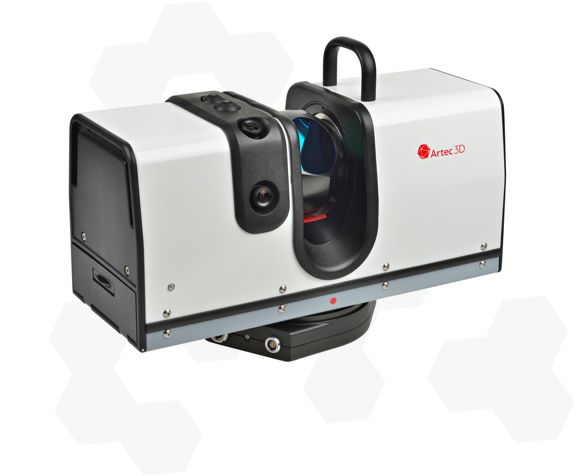 High accuracy long-range laser 3D scanner, ideal for precise capture of large objects. Scan up to 110 m away with this professional LIDAR solution. ​The fastest and most accurate long-range 3D scanner with laser technology for precise capture of large objects such as wind turbines, ship propellers, airplanes and buildings. Producing 3D scans of the highest quality, Artec Ray scans with submillimeter distance precision and best in class angular accuracy. As a result, data capture is noticeably cleaner than that from other 3D laser scanners, with noise levels at an absolute minimum. This speeds up post-processing significantly, making it a hassle free job. ​Ideal for reverse engineering, inspection and construction. Scan large objects both indoors and outdoors! The complete model of this Smart car was created from approximately 10-13 scans taken from various positions around all sides of the vehicle. We kept 10 spheres (from a Laser Scanner Reference Sphere Set) in the scanner’s field of view while capturing. We also took two scans from below, with the car raised on a car lifter. In order to get the best results, all glass surfaces and shiny parts sprayed with talc before scanning. The raw data were processed in Geomagic Design X software. Alignment and triangulation allowed us to get the final 3D model of the Smart car. The texture of this 3D model of a Klemm L25d VIIR LX-MA airplane was created using the BPR render settings in Sketchfab. We used three main settings: specular, color and glossiness. We set up a light scene with three white sources of different intensity for better reflection of the PBR. The best way to get the highest quality texture of a large object like this would be to use photogrammetry. You would need to take many photos around the object from all different angles. The light should be set evenly on the entire object in order to avoid shadows and to get good texture. Then the photos should be aligned in photogrammetry software like Reality Capture or Agisoft. After that, all you need to do is align the textured model with the geometry captured by Artec Ray. Artec Ray was place in 26 different positions around the airplane to make a complete 3D model. We used 12 small and 6 big spheres. As the spheres were magnetic, it was very easy to attach them to the metal constructions which were set up in the museum. It was not exactly easy to scan this plane, since the view was partially obstructed by some of the other exhibits on show. Also, there was a staircase in the middle of the hall, which meant that we couldn’t place the scanner right under the plane. In order to set up Artec Ray at the right distance from the plane, the scanner was placed outside the walls of the exhibition hall. And some parts of the plane were scanned through the glass doors. As the scanning process was not quite easy, it took us a whole day to scan the airplane and we used 3 three full-charge batteries. But despite all these difficulties, Artec Ray was able to make a high quality 3D model of this plane! And in fact, only during post-processing did we notice that there were two mannequin pilots sitting in the cabin! The pilots and windscreen were modeled in third-party software.